For so long it was just me and the girls every single week day with Andy joining us at the weekends. But with Alice now at school, those times only really happen during the school holidays. I long for them and cherish them when they come. I permanently countdown to the next school holidays, when I get them both every day. The last couple of Saturday mornings, Andy has been doing jobs around the house and mainly in the garden. Having moved house just before Christmas we are trying to get everything finished, but lets be honest there is always something that needs doing. So, while he has been busy I’ve taken the girls off to the shops. It’s probably doesn’t sound that exciting to anyone else, but for us we love it. The reason being that a trip to the shops, means a trip to the cafe! The trip to the cafe all started when I was pregnant with Holly and I craved victoria sponge cake. We used to go to a toddler class and then go for a nice big slice of victoria sponge and I would let Alice have a little bit. Only little of course I was a hungry pregnant mummy! This weekend was no different and the three of us headed off to the shops. We had the usual birthday presents for friends to buy and then we headed to the cafe. There are 2 cafe’s where we go, the cake cafe (Costa) as Alice calls it and M&S. We like to mix it up a bit. Today we headed to M&S and we always order the same. I will have a Latte, Alice will have a hot chocolate and Holly will have Percy Pig drink. I love this time together. Now that they are older we can actually sit and have a conversation. I don’t have to chase anyone around or try and get them to sit still. Alice and I talk about what she did at school. I love to ask her what was the one best thing about the week and she excitedly tells me. 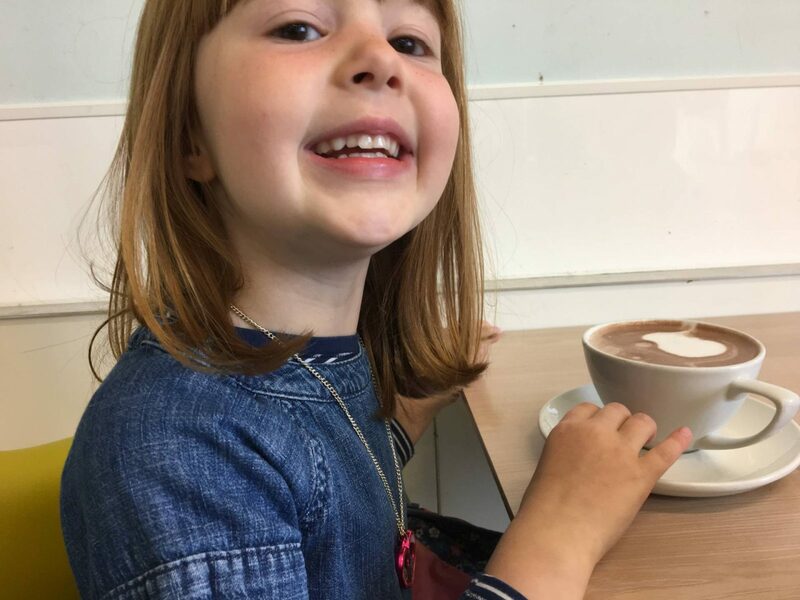 Then I ask her what was the worst thing about the week and even though I ask her every week, she still looks at me with a face that says ‘what are you thinking mummy?’ and then replies nothing mummy I love it all. I think it’s good to ask it though and it gives her a chance to share with me anything that might be bothering her and I’m sure over time she will sadly have an answer for this one. But hopefully by having open conversations she will share it with me and we can talk about it. I love listening to the girls chatting to each other, Alice being the big sister and asking Holly about preschool and what she did. They are just too cute at times. Ahh that’s a nice thing to do. My girls always enjoy a trip to a cafe too. 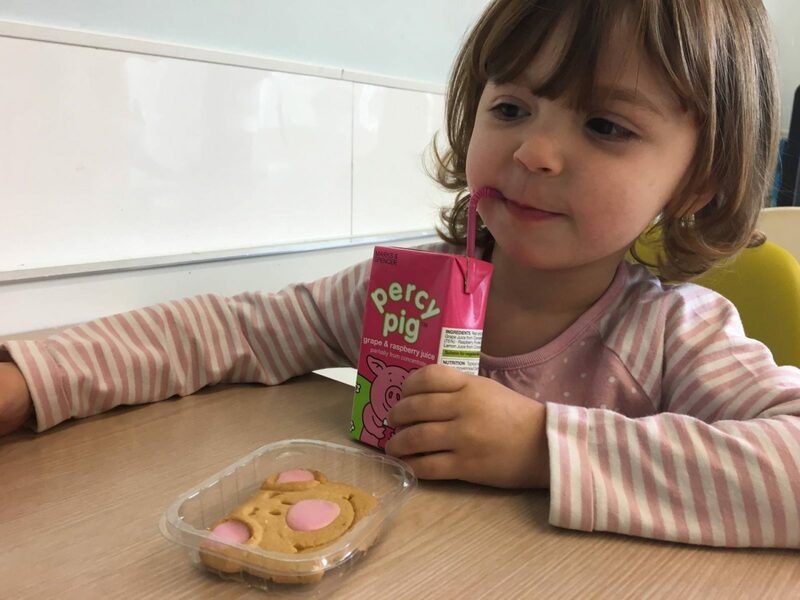 I didn’t know you could get Percy pig drinks! We always talk about our best and worst things every day at dinner, it’s fab that you do similar. I love this 🙂 Particularly great to hear your LOs have no “worst part of the week” to report! Hehe!